This Buzzard sat watching the duck/waterbird (?) for 10-15 minutes. Well, until I pressed the shutter on my camera. 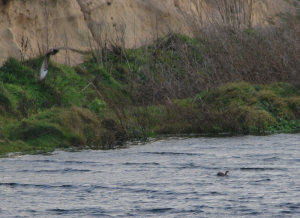 Then flew off a way and continued to watch the bird on the water. There are little duck/waterbird skulls around as well as rabbit. I thought Buzzards were carrion and also ate smaller prey. Voles, mice etc.